This article has been published Twice. Anyone who has dogs has experienced the wonderful smile a dog makes just before it decides to upchuck on your favorite carpet, or for those of us more privileged our beds. Have you ever thought about training a dog to do it in the tub or shower? Well I have had three dogs now that I was able to do this with. My first was a rescue dog. She had a very sensitive stomach and about once a week would throw up. She was very attuned to my moods and feelings and knew that I was upset every time she would get sick. Even though I never once punished her or scolded her. Well one day I was upstairs in my laundry room that was right beside my bathroom. I was folding laundry when I heard the tell tale sound of her gagging. I rushed into the hall quickly trying to decide if I had enough time to get her outside. Luckily I had had her only about 4 months and she was still very skinny so I was able to pick her up, something I couldn't have done when she was her healthy weight of 70 pounds. I decided the bathroom was closer and ran in there and put her in the tub. She of course got sick, but instead of sighing, I was jumping up and down getting all excited. She then gave me one of her rare tail wags. She knew for some reason I was pleased. At that moment I wondered if i could teach her to get sick in the tub instead of the floor. So much easier to clean up. So the next time she gave me the "Sick" smile I grabbed her collar and in a happy voice that I use to teach her commands I said "Tub" and rushed her into it. By this time she had put on quite a few more pounds so she jumped in herself. She quickly got sick with me getting just as excited. Her tail by now had come unglued from her tummy and was wagging madly. Over the months she got sick several times and each time I followed the same routine. Each time she seemed to catch on faster and faster till I could just say tub as soon as she got the sick look and she would rush upstairs on her own. As the years passed she seemed to get sick less and less but she always would rush to the tub as soon as I would catch her with the sick smile and give her the command. Sadly she is gone now but I tried the same training on Sheena. Except Sheena seems to have taken it a step further. When ever Sheena would get the same smile I would use the same routine in training her for the tub as I did for my rescued dog. The only difference was Sheena was a puppy and caught on a lot faster. But I never thought that she would start to think for herself. When she was about 10 months old I had gotten up to find a small mess in the tub. Part of me thought it was the cats but another part wondered if it was Sheena. Then one night I woke up to hear Sheena's paws hit the tub. Then I heard the heaving sounds. From the looks of it she had eaten some grass when my husband had taken her out earlier that night. Anyway I rushed out of bed and quickly praised her. Then I cleaned the tub. I was so amazed. Since then she never has to be told or supervised. And she has taught our second GSD Luca the exact some thing. I do not have to supervise him either. Sheena does though. Any time he needs to get sick she leads him into the bathroom. Ajax, Sheena's pup who is now a year old has also learned this. With 3 large dogs in the house this is sure handy. Esspecially since all of them enjoy eating grass. This is such a convenience for me. No more cleaning up carpets or beds. No more wet spots on the floor or bed. 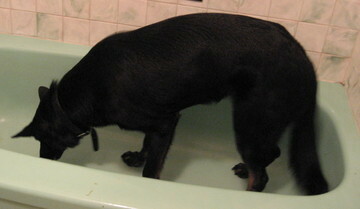 Now it is a simple matter of disinfecting the tub after cleaning up the mess.